Here is a way to display your fundraising results in a language that your board is familiar with. Inspired as the marketing equivalent to a Cash Flow statement, it takes about 3 hours to prepare, at year end – all in one page. It will help change the conversation away from reducing expenses towards planning your fundraising strategy. 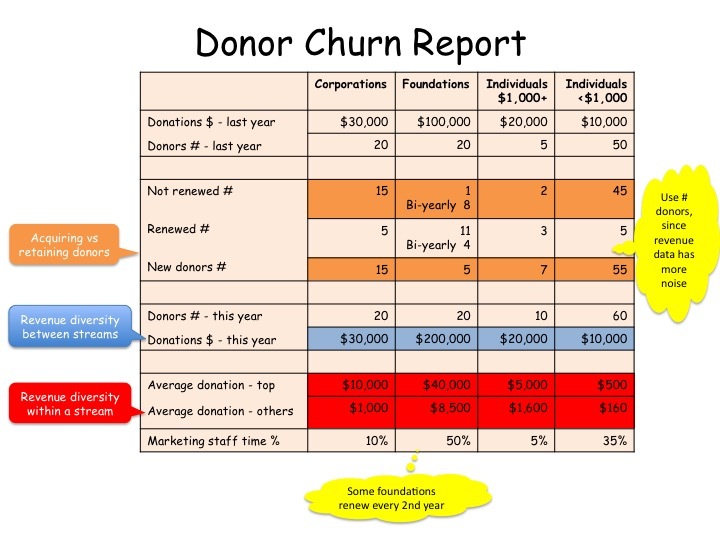 Churn is the % of your donors who choose not to donate again. This report displays the churn within each revenue stream. Up to now, if your board has been comparing balances from last year end and this year end, they may not understand the nuances within each revenue stream. Just like a cashflow statement, this report shows a beginning balance, who left, who renewed and who are new. In the example below, Boards might conclude that corporations and foundations are equally loyal. Yes, both portfolios started and ended the year with 20 donors. But the corporate portfolio experienced major churn (and staff time) while foundations were quite loyal and used less time. This report can convince the board which revenue streams could use their help. How dependent are we on any one revenue stream? How concentrated is the revenue within each stream? What is our exposure if we lose a major donor? How does our ratio compare to the industry average of “88% of funds raised comes from 12% of donors”? 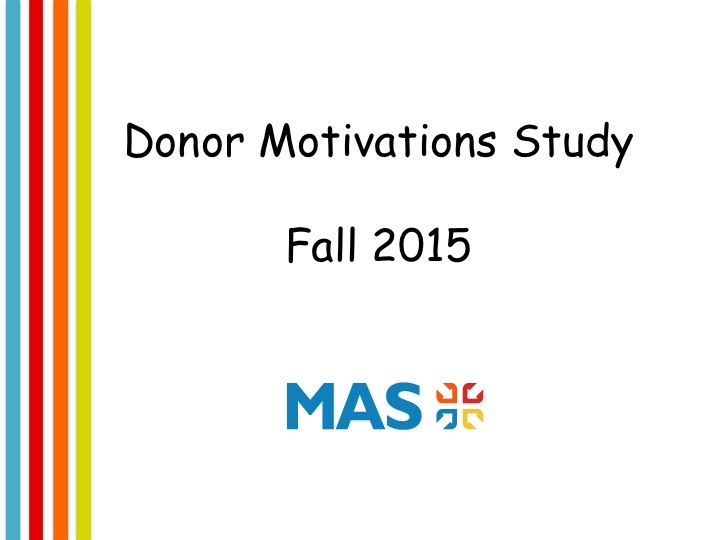 Are we better at acquiring new donors or retaining existing donors? Which donors should we target? Are some donor types more cost effective? Are some donors more loyal? Compare the retention ratios of each stream. How do they compare to the industry average of 43%? Is the allocation of staff time appropriate? Where should we put more effort or cut back? Do we have enough measures in place to track our staff time? What is the definition of a major gift to your organization? Is the $1,000 threshold appropriate or should we lower it to give more donors individual attention? Which streams should staff focus on? Which streams can Board members help with to cultivate or identify new donors? Do some donors have a higher “lifetime value”, e.g. monthly donors with automatic withdrawals vs annual donors where it is easier to disappear? How does the tenure of a donor on our database compare to the industry average of 1 year 9 months? Are we more successful asking corporations to donate (e.g. employee matching program) or to sponsor us (e.g. logo to increase their profile)? Set specific objectives for next year. To improve donor retention, review their Touch Points. To improve donor acquisition, analyze your database to define your target donors (demographics, etc) and attract similar new donors by experimenting with different marketing activities. 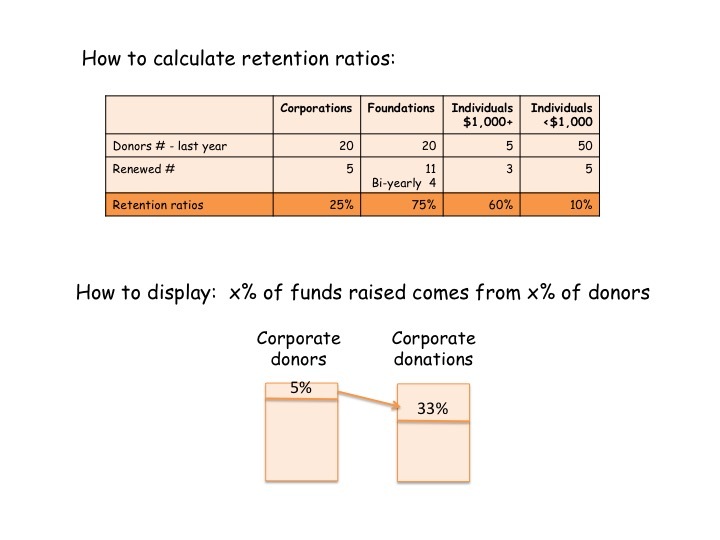 It is best to analyze the data based on number of donors because you need to track their behaviour. Although it is possible to calculate based on the value of donations, its harder to get usable data because donors vary their amounts due to external factors. Its more important to track donor behaviour over the years. Unlike audited financial statements, this report does not need to be completely accurate. It is ok to be close enough. You may need to create a spreadsheet that draws data from your donor database. Expect to spend approximately 3 hours. After that point, you may find that additional work can make the report marginally more accurate, but not change your conclusions. It is a good idea that either a senior manager or a professional volunteer attend while the spreadsheet is created to get an idea of how robust the data is and to help separate useable from unusable data.